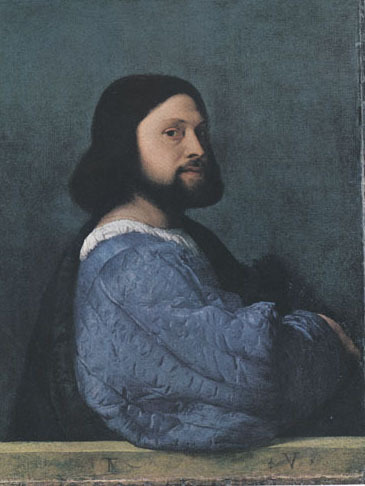 It’s also called “The Man with the Blue Sleeve.” Titian (1488-1576) painted this portrait around 1510. It’s a good example of the High Renaissance’s self-confidence, the assertion of the dignity of humanness. The power of his ego is not coming at us in a front view, which would look aggressive or defensive. No need for that. This man is so self-assured and self-contained that he can engage your full attention with only a sideways glance. The bone of his elbow is pointing at us, but we don’t see any bones or muscles that might intimidate us. No need for a display of brute force. This man’s power is deeper, beyond your peasant understanding. 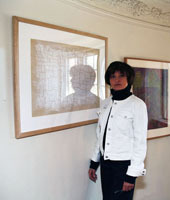 The sleeve is quilted, it’s soft: poetically anchored power. If this were a portrait of a member of the high aristocracy or the ruling class we would surely know his real name. The fact that we don’t, suggests he was of the rising middle class, a merchant perhaps. This is the confident face of the future. That confidence is conveyed in the composition itself: the triangle, the most stable geometrical shape. We’ve encountered the triangle composition before. 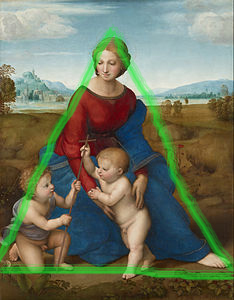 Rafael squeezes his Madonnas into triangles to satisfy his client, who needs to assure his congregation that this theology is stable, eternal and unbudgeable. In Titian’s Ariosto notice how pronounced the triangle is. A black cape is draped over the far shoulder to clarify the two equal sides of the isosceles triangle. We can’t know what the extra black fabric or fur over the left forearm is. I marked it in pink. Whatever that brushstroke represents, it’s important compositionally. It gets the eye moving upward along that side of the triangle. 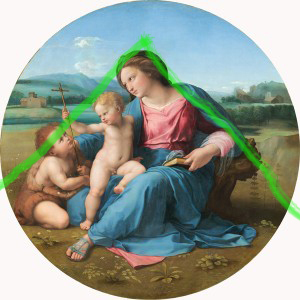 In laying out the composition with both clarity and ambiguity, Titian is thinking as a modernist, as one of us.